“It was the worst trade I ever made,” said Washington Senators manager Bucky Harris about the straight swap of shortstops. He sent Buddy Myer to the Boston Red Sox for Topper Rigney on May 2, 1927. Rigney was 30 and had five years of big-league experience. Myer, 23, had one. But two seasons later, the Senators traded the Red Sox five players to get Myer back. Myer enjoyed a 17-year career with a lifetime .303 batting average. Rigney only played in 45 games for Washington, the last 45 of his time in the majors. Rigney was a Texan by birth, born in Groveton, Texas, on January 7, 1897. His parents had both moved to Texas, mother Nora from Alabama and father Robert from Kentucky. At the time of the 1910 census, Robert Rigney was a general merchant of dry goods in the small Fannin County city of Leonard, Texas. Topper’s birth name was Emory Elmo Rigney and he grew to be 5-foot-9, a right-hander weighing 150 pounds. He self-reported his height as 5-foot-8 in his retirement. He had an older sister, Mabel, and younger sisters Iona, Mary, and Robbie. Emory attended the Leonard public schools and went on to Texas Agricultural and Technical College (now Texas A&M) where he played sports and graduated with a bachelor of science degree. He’d reportedly been signed by Detroit’s Hugh Jennings as early as 1917, but then he went into the Navy and the Tigers more or less forgot he had been signed. “Secretary Navin in ‘clearing his desk’ for the 1920 season’s business came across the old contract and immediately got in communication with Rigney.”1 He went to spring training but was farmed out to the Texas League. Earlier in 1920, when the census was taken, both he and his father were real estate agents. That year he also began his professional baseball career, playing for Dallas in the Texas League. He played in 122 games, hitting .253, and had three home runs. Dallas wasn’t sufficiently impressed and he was turned back to Detroit. Fort Worth picked up his contract for 1921. We don’t know where the “Topper” nickname came from, but he had it as early as 1920. He was also known as “Trim” and “Midget.” He married in 1920 to a Texan named Thelma Routh, whose father was a general merchant. It was Class B baseball, but in 1921 the Texas League was elevated to Class A. Rigney played his sophomore year with the Fort Worth Panthers, and stepped up his game, hitting at a .292 pace with ten homers, “and fielded like a young Wagner.”2 The Panthers repeated as league champions and Rigney was one of the top players on the team, with his batting, 25 stolen bases, and leading league shortstops in fielding percentage. Rigney became the Tigers’ shortstop for 1922 and played in every game of the season, batting an even .300 under player/manager Cobb, who hit .401. The team average was .306. Just a few weeks into the season, Cobb said, “A word about Rigney, who along with Fred Haney is one of the fastest runners on the team. He’ll be hailed as a real star.”7 Cobb was reacting to the May 8 game against the Red Sox in which young Rigney had a single, a double, and a triple; he scored the first run and each of the extra-base hits drove in runs. As the season progressed, he won three or four games with his bat and his fielding cost a couple of games. He committed a league-worst 50 errors and had a .938 fielding percentage. He was widely reported as the only recruit from the spring of 1923 to become a regular player in the American League. In 1923, the Tigers won 83 games and finished in second place, 16 games behind the Yankees. Rigney played fewer games (129, playing only one game in May due to an attack of lumbago and hampered by a hip problem that the Mayo Clinic ascribed to three abscessed teeth) but improved both his batting average (to .315) and his runs batted in (to 74).8 The Tigers only clinched second place on the final day of the year, with a 7-6 win over St. Louis. Rigney was 3-for-4 with two RBIs – tripling in the tying run in the seventh and singling in the tie-breaking run in the bottom of the ninth for a walkoff win. Detroit finished a half-game ahead of Cleveland. The 1924 season saw the Tigers win more games, but they were outpaced by both Washington and New York. They finished third, six games back. Rigney played in 147 games. His batting average dropped to .289, but his productivity increased. His 94 RBIs were second-most on the team, behind Harry Heilmann. His 102 bases on balls ranked him second in the league; Babe Ruth was number one. He had a .410 on-base percentage. He had the best fielding percentage among American League shortstops. Rigney wasn’t used as much in 1925; though he was used throughout the season, he only appeared in 62 games. Jackie Taverner played more games at short – though both hit about the same (.247 for Rigney and .245 for Taverner). The Tigers finished fourth. Taverner was seen as the shortstop of the future, and played three more full years for Detroit, but with an overall batting average of .255. In October 1925, it was reported that four clubs were bidding for Rigney’s services. 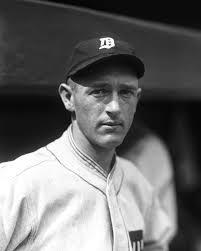 “Differences with Ty Cobb” were cited, salary among them, and Rigney refused to report to Detroit in the spring of 1926.9 On April 7, the Boston Red Sox purchased Rigney’s contract from the Tigers. He was expected to bolster their infield, and indeed he truly turned his fielding around from 1922, and (as in 1924) led all A.L. shortstops in fielding percentage in 1926. In one doubleheader he handled 24 changes without an error. He also led the league in assists. Playing for a last-place Red Sox team that lost 107 games under manager Lee Fohl, Rigney hit .270 over 148 games and drove in 50 runs (the Red Sox as a whole only drove in 525, reflecting their last-place standing). They felt they would strengthen their infield defense and they wanted to have a more veteran staff.12 It did look to be a deal that might benefit all concerned. The trade was made, a straight-up swap that Washington skipper Bucky Harris later called “the worst trade I ever made.”13 The trade was remarkable because just two years later, the Senators were so anxious to get Myer back that they traded five major leaguers to get him – and were rewarded by Myer’s excellent play for years to come. Elliot Bigelow, Milt Gaston, Grant Gillis, Hod Lisenbee, and Bobby Reeves were all packed off to Boston to re-acquire Myer. Rigney had played in eight games for Boston (hitting .111); with Washington, he played in 45 games, hit .273, and drove in 18 runs. He was benched in early June; hitting just .212, he had committed ten errors in just a couple weeks of work. Rookie Bobby Reeves was given a shot and would up doing most of the work. In the words of the Washington Post, Rigney had “almost reached stardom” in his career, but he seems to have had good seasons and not-very-good seasons and appears to have had strained relationships with at least a couple of his managers. Rigney’s last year in pro ball was 1928 for the American Association’s Kansas City Blues. He was sold to Birmingham on October 12, 1927. He said he would not report. In December, instead, he was sold to Kansas City, which was apparently more acceptable. He played 1928 there and hit .250 in 102 games. The 1930 census found him living in Harlingen, Texas, working as an insurance agent. The 1940 census listed no occupation for either Emory or Thelma Rigney, but their family had been augmented by son Robert, age eight at the time of the census. He died in a San Antonio hospital on June 7, 1972. In addition to the sources noted in this biography, the author also accessed Rigney’s player file and player questionnaire from the National Baseball Hall of Fame, the Encyclopedia of Minor League Baseball, Retrosheet.org, and Baseball-Reference.com. 1 San Diego Union, March 13, 1920. The news story said Rigney had been in the Army, but he himself told the Hall of Fame that he had served in the Navy in 1918 and 1919. 2 United Press syndicated story which appeared in numerous newspapers on April 5, 1922. E.g., Riverside Daily Press, Riverside, California. 3 Jim Moyes, “Donie Bush”, SABR BioProject biography. 4 Washington Post, March 27, 1922. 5 Fort Worth Star-Telegram, November 26, 1921 and San Jose Evening News, August 11, 1922. 6 As reported by the Fort Worth Star-Telegram, April 26, 1922. 7 Christian Science Monitor, May 9, 1922. 8 The medical matters were mentioned in the Cleveland Plain Dealer of April 3, 1924. 9 Canton (Ohio) Registry and Boston Globe, both April 8, 1926. 10 Boston Globe, May 3, 1927. 11 Washington Post, May 3, 1927. 12 See Burt Whitman’s story in the May 3, 1927 Boston Herald. 13 The Sporting News, July 1, 1972. 14 Omaha World Herald, April 5, 1953.